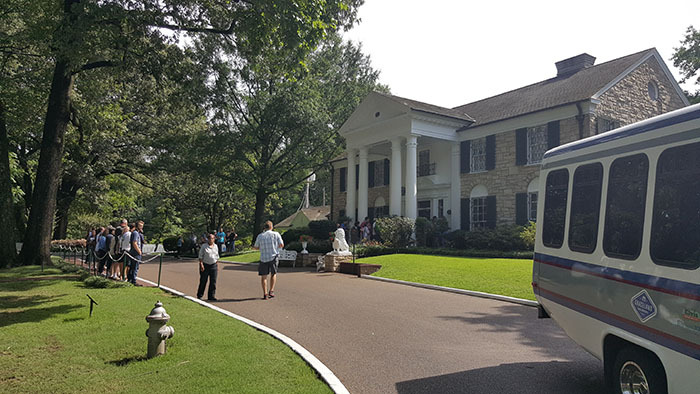 We got up early and drove around to the south side of Memphis, arriving at Graceland just as the gates opened. I read on several websites that Graceland was busiest in the morning, but it wasn’t too bad at all. After parking the bus, getting tickets and watching the little 7 minute orientation film,we were still in the first couple of groups to tour the mansion. They’ve done a great job with the tour. Each person gets an iPad and headset, and can go at their own pace listening to a tour given by John Stamos. It’s nice because it’s very detailed and easy to hear and doesn’t rely on one tour guides knowledge and ability to talk to groups. I didn’t take pictures of all the rooms, but there were a couplee that struck my fancy. 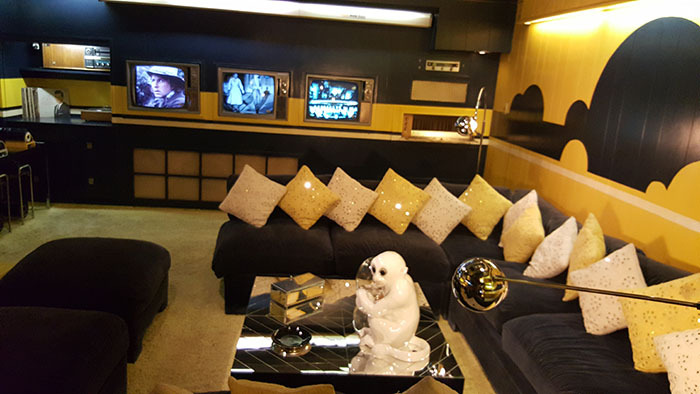 TV room – with 3 televisions and a huge, huge sofa. 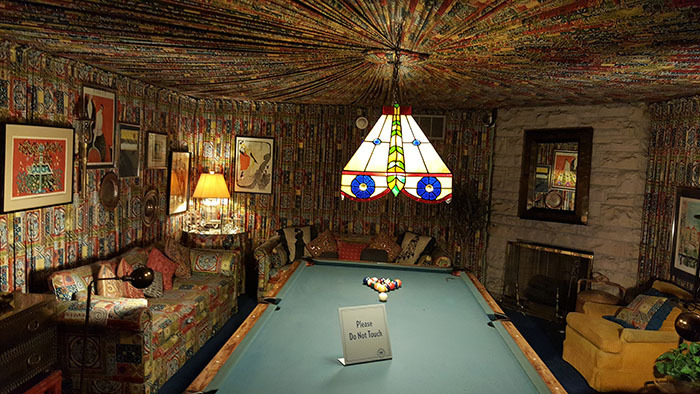 Pool room – walls and ceiling covered in fabric – 350 yards of fabric! I especially liked the room that had family history information. The way they presented Elvis’ life, family and ancestry is JUST like I would like to do for my family ancestry. Interesting, not too long, well documented and full of details to keep your attention. 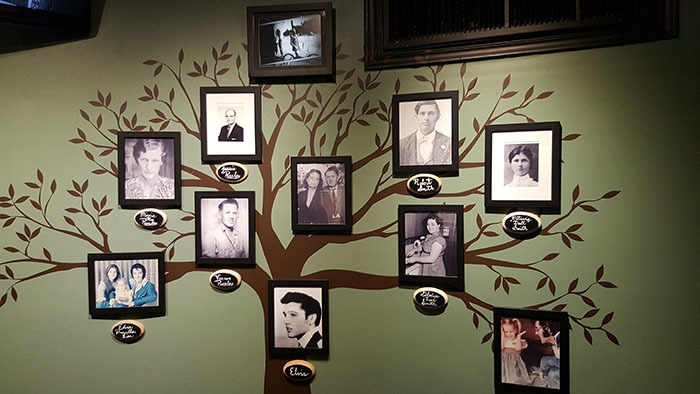 Family tree – what a great way to display it. 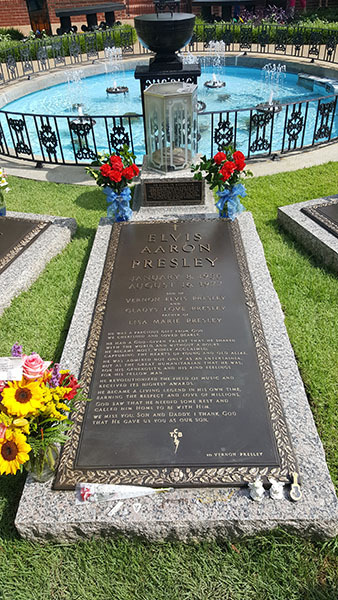 The last step on the tour is the Meditation Garden, where Elvis and his parents are buried. The cars. 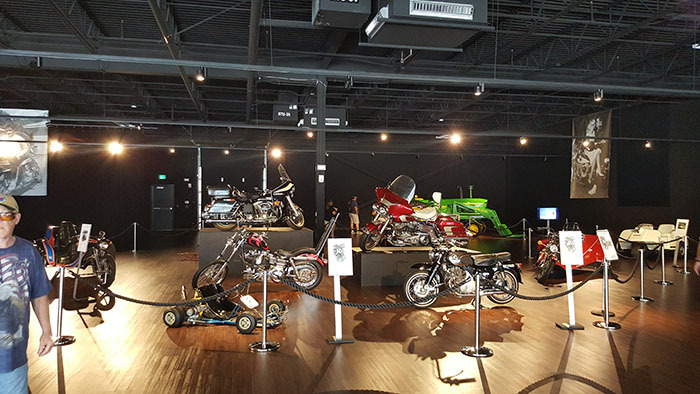 Two huge rooms filled with Elvis’ cars, motorcycles, golf carts and even a John Deere tractor. The movies and music. A whole display of the movies he starred in, including posters and memorabilia (mostly clothes) from each, and several screening rooms where you can watch all or part of the movies. 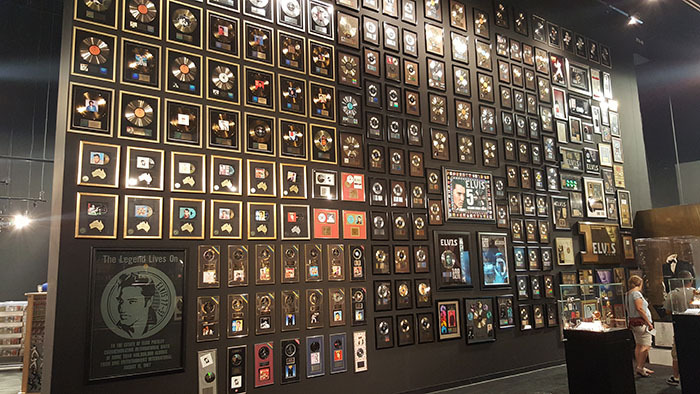 There’s a separate room for his awards and gold/platinum records, which includes a huge wall with the various plaques and awards. 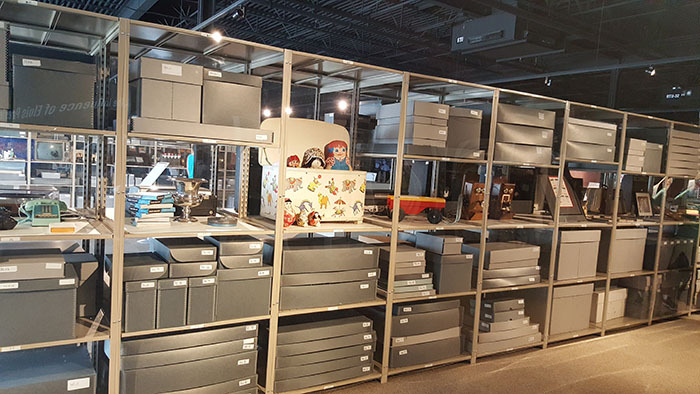 Solid wall of awards – 20 feet high and probably 30 feet long. The effect on others. Then there is a whole display of the many, many musicians who have been positively affected by Elvis’ contributions to the music scene. Very touching and interesting to read the comments from everyone from Dwayne Johnson (the Rock), to John Lennon, Glen Campbell, Dolly Parton, Bruce Springsteen, Johnny Cash and many, many others. 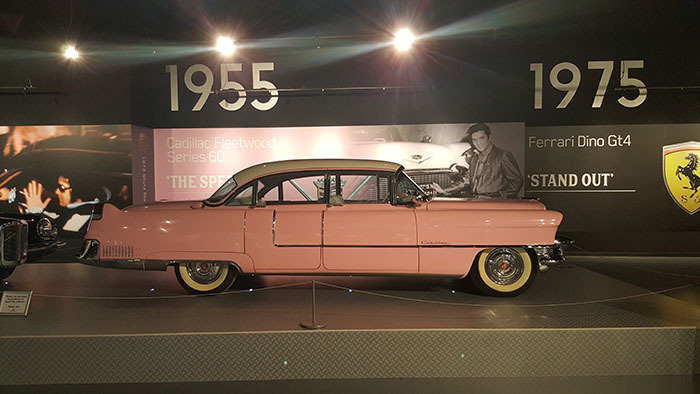 There was a section with the Presley archives that was impressive — especially to someone like me who has been the “family historian” for many years been trying to archive and protect family documents and history! Finally, there was the costume room, which had many of Elvis’ costumes from his concerts, as well as some of his everyday clothing. The haberdashery shop attached had replicas of his jewelry, shirts and concert costumes for sale. No caption necessary! The ultimate Elvis. All in all, it was a fascinating look into the man and the legend, well presented and quite easy to follow and understand. 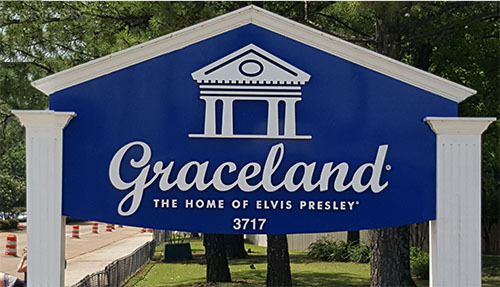 Leaving Graceland, we got back onto the freeway and circled around to the northeast side of Memphis, caught highway 70/79 and headed toward Nashville. We didn’t actually go to Nashville — the highway goes a bit north. We’re staying in Clarksville (at a Sam’s Club) tonight Tomorrow wehead up through Kentucky tomorrow, stopping somewhere along the way to do laundry. We have reservations in Saratoga Springs, NY starting on July 11th (although I want to be there on the 9th), so we have to book right along on the days we’re driving so we’ll have time to stop for a few days, hook up and get some work done. The goal is 3 days driving and boondocking, then 2-3 nights hooked up at an RV park for work, showers, and some calm time. Oh, and finally — we drove our 18,000th mile today. That’s since starting August 11, 2015.